COCOON VINYL BOND B is an adhesion promoter and prime coat for the Cocoon series of products. COCOON VINYL BOND B is an adhesive resin solution which can be sprayed onto any clean, dry building surface, where it will rapidly condition the surface to accept the appropriate Cocoon coating. COCOON VINYL BOND B may be used over gypsum board, wood, masonry, concrete, and metal surfaces. A minimum surface profile of ½ mm should be maintained for maximum adhesion. After proper masking, prime the entire surface with the Vinyl Bond B directly from the can by spray or roller and allow it to dry. When dry, the surface should be glossy and a light blue color. Prime only what can be comfortably coated in a day so as not to expose the primer to excessive moisture overnight. Do not apply Vinyl Bond B over webbing coat. For recommendations regarding equipment, contact our Technical Department. Proper ventilation must be provided during application for effective drying of the coating, and all applicators must wear respirators. COCOON VINYL BOND B must be protected from inclement weather during application. Application should cease upon commencement of precipitation. 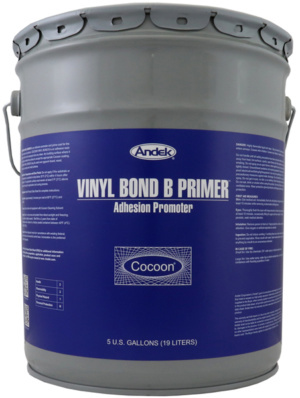 Damaged areas may be re-primed by cleaning and re-spraying the COCOON VINYL BOND B as described in the Application section.